Amit Goswami was a professor of physics at the University of Oregon in Eugene, Oregon. Although he remains very active, and is internationally known, he has retired from the university where he taught theoretical quantum physics for over 30 years. During his visit to Drew University several years ago, Dr. Goswami lectured on the subject of consciousness and its relationship to matter. People, when asked to define it, generally think of consciousness as awareness, but for Goswami, and similar thinkers, consciousness is so much more. 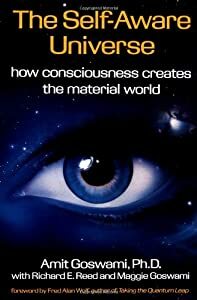 In their view, consciousness created and continues to create reality, more specifically, the material world—indeed, according to this viewpoint, although it may sound strange to those who do not share it, consciousness created our brain and all other forms of matter. Although one can find a number of scientists and philosophers who do not share Goswami’s ideas, there are theoretical and experimental models in physics that lend support to his position. The support is based on the idea that for matter to come into existence, it must be observed or measured. Prior to being observed or measured, “reality” exists as “waves of possibilities.” We humans never get to see reality or the universe in its wave form because whenever we open our eyes to look, our consciousness collapses the wave function into observable or measurable matter. Think of any person being anywhere on earth where she or he is alone, but looking forward–as physicist Nick Herbert explains, the reality that exists behind our back is in wave form, and we cannot turn quickly enough to see it because as soon as we turn to observe it, we freeze it into its matter state. Even with the surprising knowledge that we have about the relationship between consciousness and reality, the nature of consciousness is not fully understood. Still, an increasing number of scientists–in the disciplines of psychology, neuroscience, physics, biology, and computer science–have made consciousness a topic worthy of exploration. The study of consciousness is increasingly becoming a hot topic in the academy; but for those of us who are aware of the history of psychology, the discipline is revisiting a topic that was previously deemed important over a hundred years ago–that is, before a very strong adherence by many psychologists to the tenets of the psychology known as behaviorism overshadowed it. Today, biologists, neuroscientists and even some psychologists reasonably ask the question, “What is the relationship between consciousness and the brain?” These scientists seek to identify and/or understand the neural mechanisms that give rise to consciousness. Certainly a relationship exists between brain and consciousness, but does consciousness emerge from a physical substratum? According to Goswami, it does not. During a lively discussion in my personality theories course, a student argued the case for the importance of the brain in creating consciousness and personality, in effect posing the view that consciousness was a byproduct or epiphenomenon of brain activity He was decidedly surprised when I told him I shared a belief with some other scientists who would readily argue that consciousness is not a byproduct of the brain, and moreso consciousness does not need the brain to exist. Indeed, in a more grand view of things, consciousness “produced” the brain rather than the other way around. The basis, if not the strength, of each of our arguments was centered on belief; that is, it all came down to how we viewed causation which in our discussion opened the door for me to briefly talk about the concepts of “top-down “ vs. “bottom-up” causality. In a bottom-up view of the universe, matter is fundamental to reality. Sub-atomic particles, atoms, molecules, genetic strands, cells and other forms of organic matter built upon each other, the result being the creation of the human brain from which consciousness emerges. In a top-down view of causation, even the Big Bang was the result of consciousness. The Big Bang existed in wave form, just like everything else, but in order for it to come into existence, it needed to be observed. In the top-down view of causation as Goswami stated, “consciousness is the ground of all being.” By this statement, Goswami means all of reality–and here is where things become even more interesting–the reason being because it begs an answer to the question who or what observed or measured the universe at the prime level or at the very beginning? According to Goswami, it had to be a sentient being. To some philosophers, theologians, many plain, everyday folks, and even some scientists– that sentient being, is best described by the words the Prime Mover, the Prime Being (other similar names in meaning) or simply by the word– God. This entry was posted on Wednesday, March 20th, 2013 at 11:28 pm	and tagged with Amit Goswami, Big Bang, Consciousness, Drew University, Goswami, Nick Herbert, Subatomic particle, University of Oregon and posted in Consciousness Studies. You can follow any responses to this entry through the RSS 2.0 feed. What do you suggest I read to learn more about “top-down “ vs. “bottom-up” causality? I am intrigued by the concept. You can start with Dr. Goswami’s Self-Aware Universe. Note “top-down” causality and “downward causation” mean the same thing, and “bottom-up” causality and “upward causation” mean the same thing. Knowing this will allow you to read more broadly about the concepts. As a man of faith and a man of science who has never viewed these positions as necessarily antithetical, much less incompatible, I have always quietly held a hypothesis that the Prime Mover (who I feel comfortable calling “God”) could have easily called all matter into being through the Big Bang. In orthodox Judeo-Christian narrative, to God a thousand years is as a day, and one day as a thousand years. The literal seven day creation narrative espoused by many (not all) Judeo-Christians could have just as well been seven millenia. What we know about both science and faith are so limited compared to the vastness of what is. I believe our knowledge advances as we aggregate what we know from both fields. Within that context, what both you, Dr. Jennings, and Dr. Goswami hold to be true is both plausible and probable. To me, it is more than that, it is quietly, simply, true. So glad to read another inspiring blogg, Dr. Jennings. Our collective consciousness is expanding exponentially and the experience is giving us the opportunity explore all possibilities. We are so fortunate to be living in an age when such discussions are encouraged. Thanks for sharing.